The exhibition "Nothing stops the idea of art" took its title from the public space installation with which the guests entering the museum will be confronted. A speed bump, characteristic for residential streets, with the slogan painted next to it serves as an intriguing signal of the exhibition’s message, tackling the problems of the sense of art and the way art functions in contemporary reality. 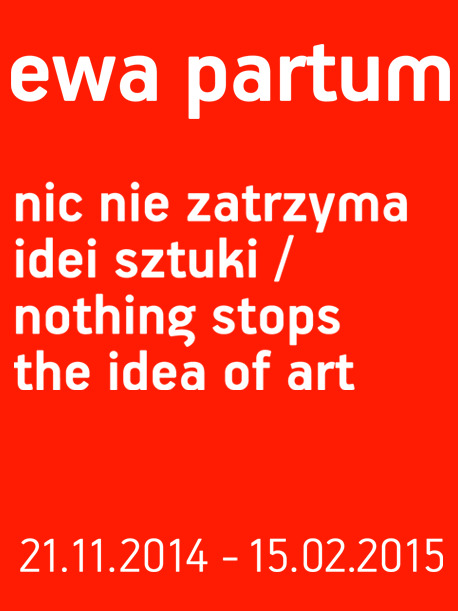 Ewa Partum is a precursor of conceptual, feminist and critical art in Poland, an author of actions and installations in public space, a film maker, photographer, last but not least a performance and visual poetry artist. She studied at the State Higher School of Fine Arts in Łódź (now Łódź Fine Arts Academy) and Fine Arts Academy in Warsaw. Her earliest conceptual work "Presence/Absence", created in 1965, while still a student, took up the problem of women’s presence in progressive art environment. Ewa Partum was the first Polish artist to take up the feminist discourse so intensely. Already in 1971, in "poem by eva" she signed the imprint of red lips on paper "my touch is a touch of a woman", and developed the tautology of the alphabet further to arrive at the statement "My problem is a problem of woman." The idea of the performance called "Change", staged in Łódź in the Address Gallery in 1974, was to turn the artist’s face into the work of art by putting makeup on it. In 1979, in the Artforum Gallery, Ewa Partum had half of her body characterized to appear old in front of the audience. The action was a critical voice against objectification of women. As the sole woman artist in Poland, Partum consistently continued the feminist practice, amongst other, in the series "Self-identification" or in the performance called "Women. Marriage is Against You!" In 1971, she carried out a pioneering action "The Legality of Space", identifying the city public space as a place of political debate and clashing of different attitudes and ideas. Performed at Wolności / Liberty Square in Łódź, the action involved putting up densely on display various orders, banning and mandatory signs - both real and fictional, ironic ones, such as "It is forbidden to forbid", "It is forbidden to allow". In 1972, the artist launched an independent mail-art gallery "Address" in 86 Piotrowska Street in Łódź, exchanging correspondence with the international avant-garde (Włodzimierz Borowski and Krzysztof Wodiczko among others collaborated with the gallery). In the same year she staged a performance and an installation called "Metapoetry" in Muzeum Sztuki, combining visual arts with poetic inspirations. Another important performance, also staged in Łódź, was "Homage to Solidarity" (1982). The artist currently lives and works in Berlin. In 2006, she completed a performance and an installation in the Turbine Hall at Tate Modern in London. In recent years, she has participated in many exhibitions around the world, just to mention: 2014 Le Mouvement Biennale in Switzerland, Art Triennial in Paris, 18th Biennale of Sydney, Manifesta 7 in Rovereto, WACK! Art and the Feminist Revolution at MOCA Los Angeles. She collaborates with M + R Fricke Gallery in Berlin. In 2009, due to the initiative of Krytyna Potocka from the Manhattan Gallery in Łódź, the Conceptual Museum of Ewa Partum was created (six plates located in the spaces the artist's performances, including Muzeum Sztuki in 36 Więckowskiego Street). In recent years Muzeum has acquired many of the artist’s new works, displayed e.g. at the exhibition "For You", and the current one "Atlas of Modernity. The 20th and 21st Century Art Collection”. The installation "Legality of Space", the keynote of Ewa Partum’s artistic output, was repeated two years ago at the site of the 1971 action at the initiative of the Political Critique Association under the title "Reenactment - Legalizing space''. The exhibition at Muzeum Sztuki aims to determine the meaning of Ewa Partum’s work for Łódź artistic scene. It also corresponds with the museum’s individual exhibitions program, presenting outstanding artists’ works and posing the question about their status in the history of art. The exhibition will present Ewa Partum’s works from the collections of Muzeum Sztuki in Łódź and the National Museum in Warsaw, as well as from several private collections, archives of Ewa Partum, the Signum Foundation (Poznań) and Osman Djajadisastra Collection (Aachen). A Polish-English exhibition catalogue with the leading article by Jean-Francois Chevrier, Professor of ENSBA, Paris and the texts by Dorota Monkiewicz (on Address Gallery) and Karolina Majewska (on "Legality of Space" and the contemporary reception of the work) is underway. The publication by Muzeum Sztuki will include the interview with Ewa Partum. Many faces. Claude Cahun, Cindy Sherman, Aneta Grzeszykowska. Meeting as partof the “Championess” series of encounters at Ewa Partum’s exhibition. Conductedby Agnieszka Wojciechowska-Sej. Mini. Coco Channel, Cocquelline Barrier, Marry Quant. Meeting as part ofthe “Championess” series of encounters at Ewa Partum’s exhibition. Conductedby Agnieszka Wojciechowska-Sej. Like a woman? Georgia O’Keeffe, Louise Borgouise, Niki de Saint-Phalle. Meetingas part of the “Championess” series of encounters at Ewa Partum’s exhibition.Conducted by Agnieszka Wojciechowska-Sej.